Out With the Owl…In With the Peacock! Last year it seemed owls were everywhere. Now, I’m seeing a lot of peacocks. Well, one thing’s for sure: birds are big right now. 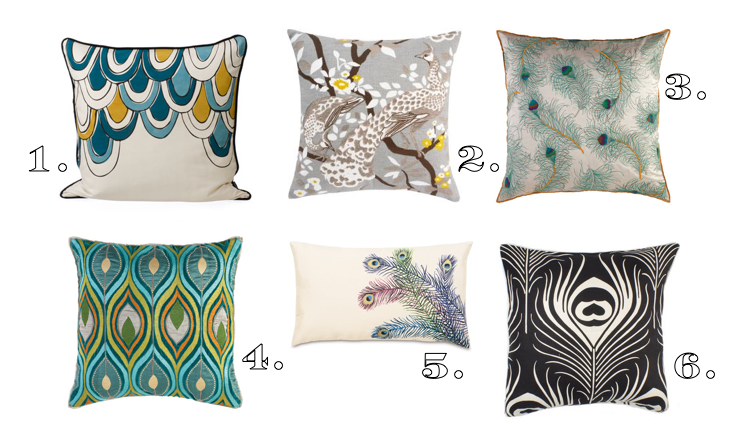 Here are six perfect peacock pillows to get you through the next few months of bird-frenzy. What do you think is next? Ostrich? Swan? ← I’m now on Twitter!! I love someone who loves peacocks! Love the peacocks. I was thinking about using the dwell fabric in my dining room. Do you know what colorway the pillow is? TIffany — I think it’s citrine — the fabric is available at Calico Corners or various online retailers.